For high performance athletes and hard training competitors, reaching their required daily protein intake is of the utmost importance... even while they're asleep. 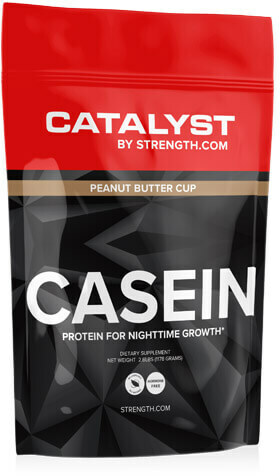 Supplementing with Catalyst Micellar Casein is ideal for before bed and other long stretches of time where you're likely not taking in any food or nutrients for hours. CATALYST by Strength.com Micellar Casein has been formulated by experts to help athletes achieve their best results possible by fuelling the body during this crucial recovery period. These statements have not been evaluated by the Food and Drug Administration. This product is not intended to diagnose, treat, cure, or prevent any disease.